Today, sadly, was my last day of ice fishing for the 2013-2014 ice fishing season. A season that started back on the weekend of Thanksgiving in Northeast Iowa, has come to an end. It was a great ice fishing season, I was able to get the snowmobile out quite early on the lakes allowing me a lot of mobility, the way I like to ice fish. 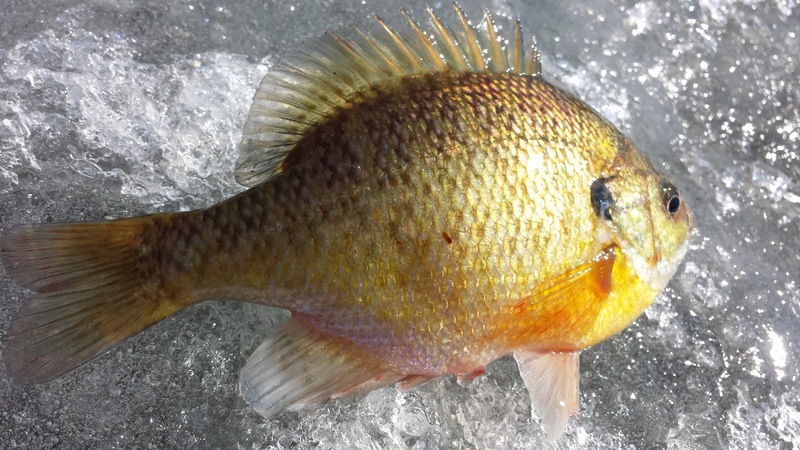 Here is the long list areas I ice fished: 3 farm ponds, Rock Creek Lake, Hickory Grove Lake, Big Creek Lake, Otter Creek Lake, Red Rock Lake, 2 different private quarries, and Sun Valley Lake. I didn't get to reach out and try as many different lakes as I wanted to, mostly due to bad weather on the weekends. However, 11 different bodies of water is good, as much of my ice time was devoted to tournaments on Big Creek, Rock Creek and Hickory Grove lake. On to today, the last ice day of the season found me at Otter Creek. I have been here several times this month, for one it is a short trip, and the ice has been very thick and the fish have been cooperative. 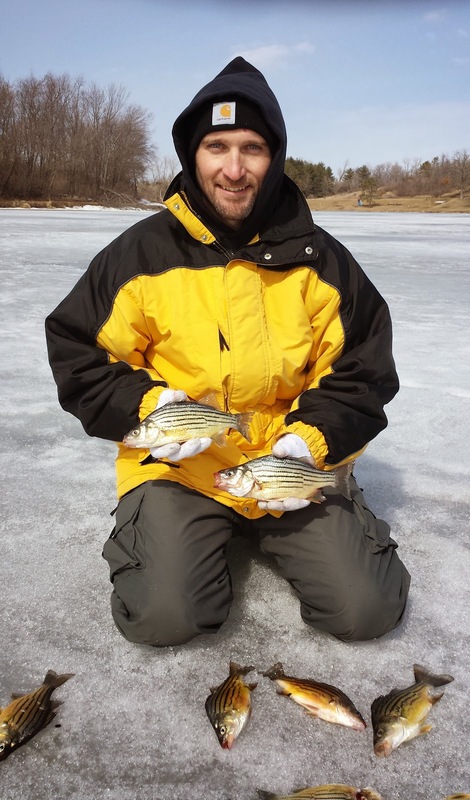 It wasn't my best day on the ice, but managed some Yellow Bass, a few gills, and some more time on the ice with a new ice fishing friend, Jacy. It is always bittersweet on that last ride home, knowing that it will be at least November until I am "walking on water" again. However, the open water season, and the bass tournament season is just around the corner, it is time to transfer my focus to the boat, and the open water gear. In most years, the middle March would find me in the boat casting for bass, not this year! The ice is still good at certain places around Central Iowa, but you must pick your areas and "know" the ice. Yesterday, my friend Jacy Large and I headed to Otter Creek Lake to search for some last-ice fishing. We were not disappointed in what we found. We fished in waters from 5 feet all the way to 14 feet of water. We caught quite a few Crappies, a Bluegill, a few Largemouth Bass and a lot of Yellow Bass. the best thing to do at lakes infested with the nuisance species. 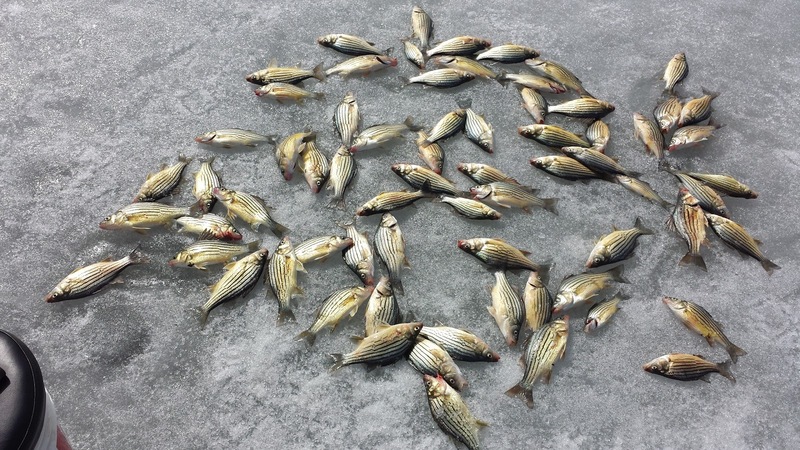 We helped do our part by taking out 60-70 Yellow Bass. Some were given to other anglers on the lake, Jacy kept some for a family meal, I gave a meal to my neighbor and still had 40 fillets for a fish fry in the near future with friends. Yellow Bass are fun to catch, but please take some time to learn about them and try your best never to spread any invasive species to waters you fish. My brother Tim has a boy who loves being outside and active. 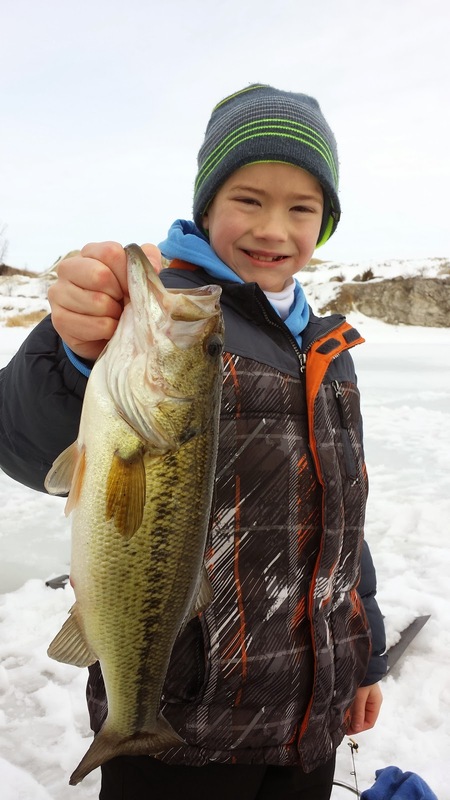 For the past couple years I have tried to get him out on the ice, but it seems like the weather just never cooperated for a young boy to get out and enjoy the sport...he was due for a ice fishing trip. On this weekend though, things turned out just right. We headed to a private lake to try some ice fishing, the first time for him. He was intrigued, and very inquisitive about the whole process of drilling holes and trying to find out where the fish might be swimming. My nephew is a bright, and very mature kid, and like other kids I've taken out on the ice he learned how to use the Vexilar in the matter of seconds. He loved watching his jig go up and down and the occasional fish swim up to take a look at his bait. Although he didn't reel any in that day, he was smiling throughout the 2 hour trip. I was lucky enough to hook into something big that day, so I told him to come help me out. He moved the Vexilar out of the way, and watched me the battle the big fish. When it was all done, he was proud to hold up as a small victory for our trip. We only caught a couple of fish, but I know if the occasion ever comes up again, he would race for the truck with his snow gear on! One last time at "The Rock"
I headed out to Rock Creek Lake one last time this weekend to meet up with a fellow ice angler really starting to get "bit" by the ice fishing bug. The temps were in the single digits, and with the north wind, the windchill was well below -10 degrees. I was the first to arrive at the lake, and hit a couple new areas, I try to do this each time out on a familiar lake, because you can never know your local lakes too well. I caught a few smaller ones, but the new areas weren't impressive. Now I know. Jacy showed up and we quickly jumped to an area that I knew would be a good for some fish. It didn't disappoint. 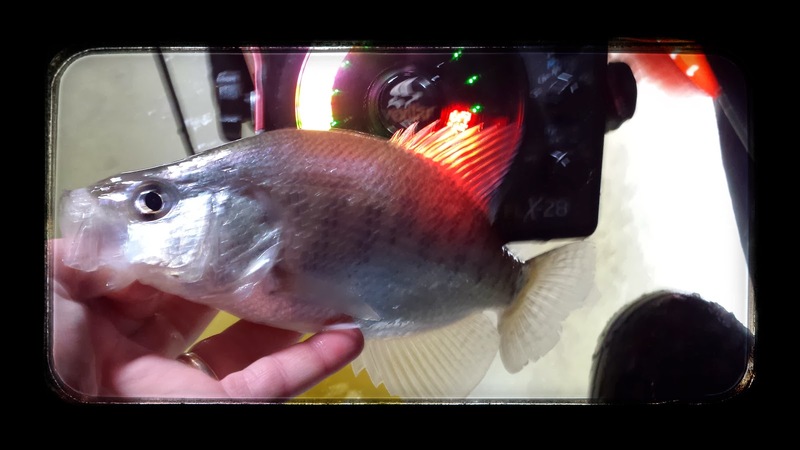 Crappies, bluegills, and a few bass showed themselves that morning. All were a very welcome site for us. We had settled into Jacy's shack, a roomy 2-man Clam Warrior shack. A small heater kept us just right in the shack. We had to change up colors several times, but finally figured that oranges, and chartreuse colors were the deal for the day. It was a great morning to challenge Mother Nature, and being March 1st, you just never know how many more days on the ice you will get. I was very pleased with the fish we caught and Jacy ended up with a nice mess for a family fry.